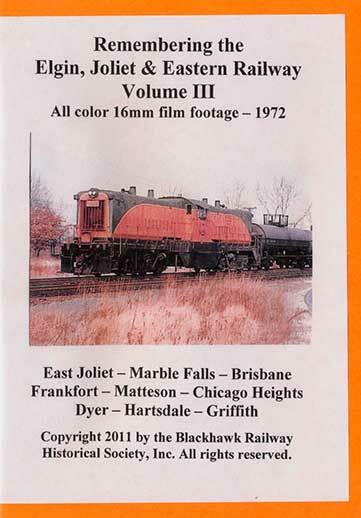 In the Summer of 1972, the Elgin, Joliet & Eastern Railway Company attached a professional 16mm film camera to the top of a hi-rail truck and took movies of their mainline from Waukegan to Joliet to Gary, as well as the South Chicago and Porter branches. The reason for this movie shoot has been lost to history, and if it wasn't for the actions of a Blackhawk Chapter member and EJ&E employee, the films themselves might have been lost too. Fortunately, the films were rescued from the trash heap, put on reels and finally shown, displaying a railroad and suburban landscape vastly different from what exists today. 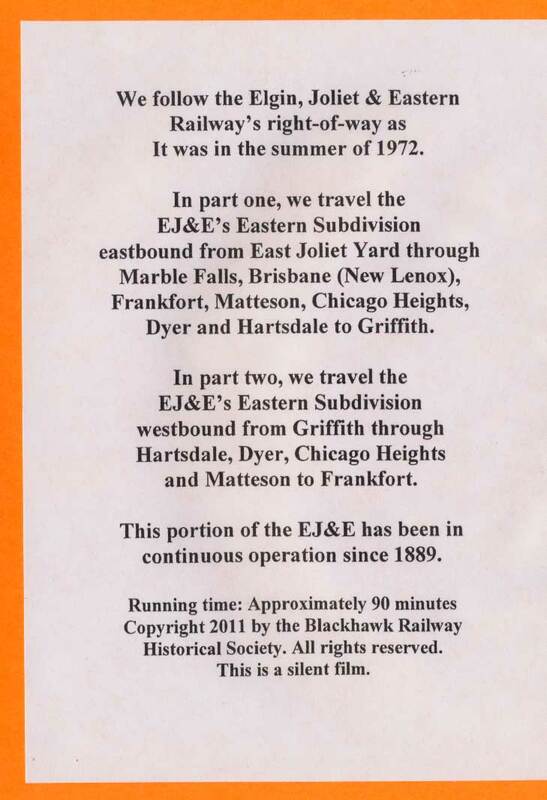 Now, the Blackhawk Chapter is offering fans of �the J� and 1970s-era railroading a unique perspective of this unique railroad. Experience an engineer-eye's view of the EJ&E as it rolls past heavy industry, cruises through unspoiled farmland and intersects the region's other railroads at many famous and some long-forgotten junctions. These original 16mm all-color and silent films from the Blackhawk Chapter archives have been transferred to DVD, and include a map and system timetable for reference. Lenox), Frankfort, Matteson, Chicago Heights, Dyer and Hartsdale to Griffith. Part Two returns westbound from Griffith through Hartsdale, Dyer, Chicago Heights and Matteson to Frankfort. Preview video may contain segments from other volumes in this series.